Sometimes when it's hot outside it's hard to think about cooking dinner. I just want to grab a salad or Popsicle or just something light. Which means sometimes we don't eat very healthily in the summer. I've been searching for light meals to cook for when we feel like this at my house and I came across some pasta recipes but nothing that my kids would eat. We decided to create our own using ingredients we love. Brown sausage in a pan, drain and set aside. Cook noodles according to directions on package, rinse in cold water, drain and set aside. Cook broccoli in microwave following directions on the package. Mix broccoli, sausage, penne and butter in a pan on the stove. Stirring occasionally, just long enough to melt butter over noodles and make everything nice and warm. 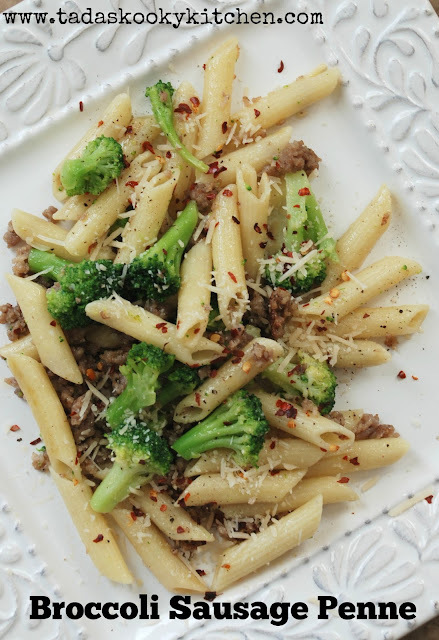 Serve with Parmesan cheese, crushed red pepper, and salt and pepper to taste. We seriously have this meal about once a week. It's becoming one of our favorites since it has a ton of flavor, is filling, and it's super fast and easy to make.